Automated Manufacturing Inspection Cells | Robotic Inspection Integrator - JH Robotics, Inc.
JH Robotics offers and integrates a wide variety of inspection systems which can include both contact and non-contact systems. 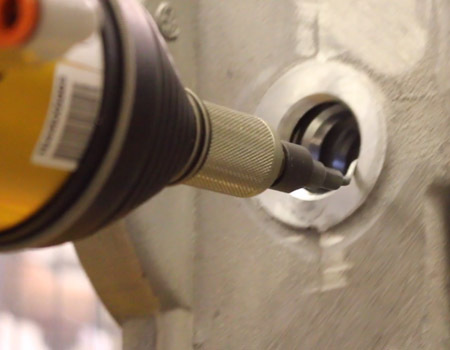 Our advanced automated inspection systems can be designed to verify markings on a component, verify height and depth as well as surface uniformity, verify the presence of components, and much more. In automating the inspection process we utilize high speed vision technologies, laser inspection, depth, height and pressure sensors and many other components into the automated inspection cells we build for our customers. Our team of engineers, designers and integrators have the experience to successfully integrate automation into your inspection process. With over 30 years of experience in the robotics industry we’ve become the experts that manufacturers rely on when it comes to automation. Call us today at 607-729-3758 or visit our online estimate form to get started on making your company more productive, more profitable, and running lean.